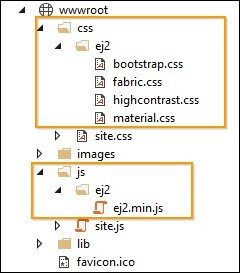 Syncfusion provides the Visual Studio Project Templates for the Syncfusion ASP.NET Core platform to create the Syncfusion ASP.NET Core Web Application using Essential JS 2 components. The Syncfusion ASP.NET Core (Essential JS 2) project templates are available from v16.2.0.41. 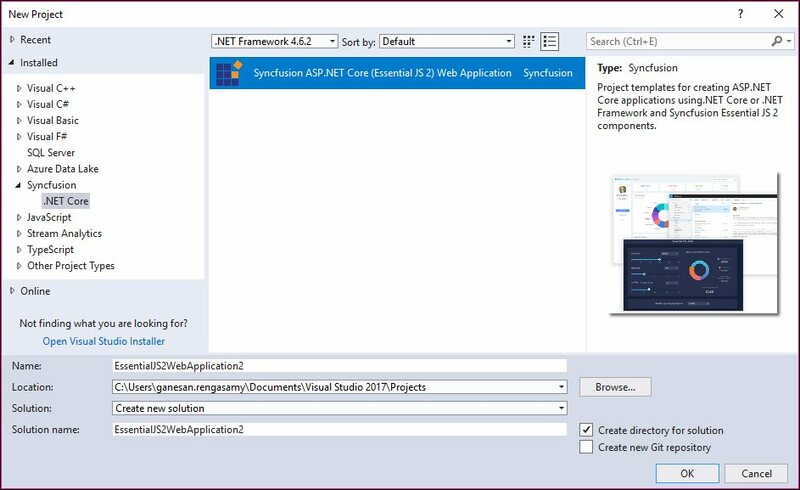 Click Syncfusion Menu and choose Essential Studio for ASP.NET Core (EJ2) > Create New Syncfusion Project… in Visual Studio. Choose File > New > Project and navigate to Syncfusion > .NET Core > Syncfusion ASP.NET Core (Essential JS 2) Web Application in Visual Studio. Name the Project, choose the destination location, and set the framework of the project, and then click OK. 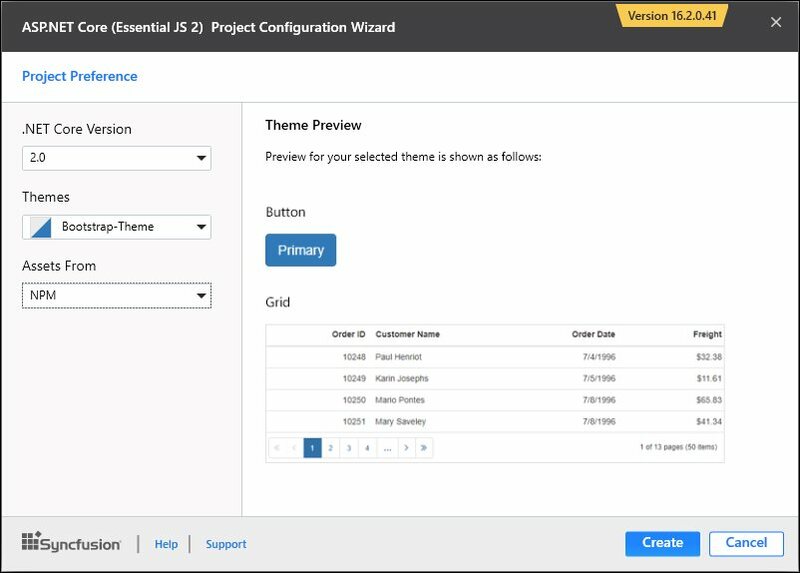 The Project Configuration Wizard appears. Minimum target framework is 4.5 for Syncfusion ASP.NET Core (Essential JS 2) Project Templates. Choose the options to configure the Syncfusion ASP.NET Core (Essential JS 2) Application by using the following Project Configuration dialog. .NET Core Version: Select the version of ASP.NET Core Project, either ASP.NET Core 1.0, ASP.NET Core 1.1 or ASP.NET Core 2.0. Assets From: Load the Syncfusion Essential JS 2 assets to ASP.NET Core Project, either NPM, CDN or Installed Location. Theme Selection: Choose the required Theme. Click Create, the Syncfusion ASP.NET Core (Essential JS 2) Application has been created. Required Syncfusion NuGet/NPM packages, Scripts, and CSS have been added to the Project. Then, Syncfusion licensing registration required message box will be shown as follow, if you are installed the trial setup or NuGet packages since Syncfusion introduced the licensing system from 2018 Volume 2 (v16.2.0.41) Essential Studio release. Please navigate to the help topic which is shown in the licensing message box to generate and register the Syncfusion license key to your project. Refer to this blog post for understanding the licensing changes introduced in Essential Studio.